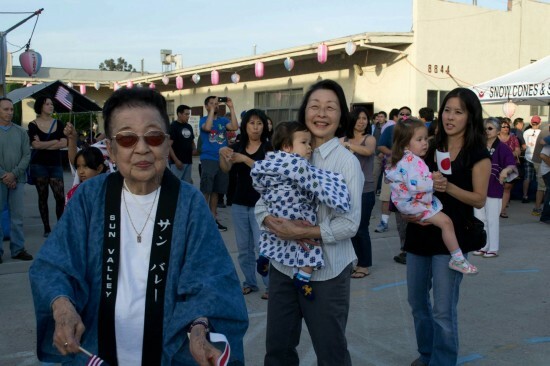 Valley Japanese Community Center’s 60th anniversary will be celebrated on Sunday, Nov. 17, with a luncheon at The Odyssey Restaurant, 15600 Odyssey Dr., Granada Hills. In addition to celebrating the past 60 years, attendees at the buffet luncheon will embrace the future of the Valley Japanese Community Center, which is located in Sun Valley. Entertainment for the afternoon will be provided by Chikara Taiko, Matsutoyo Kai (minyo), and classical dancer Janet Takimoto (Bando Hiromisa), plus a special performance by Ted Yamada of KDI Music. A group photo will be taken after the event. The cost is $40 general, $20 for those under 17. For more information or to receive a reservation form, contact Christine Inouye at [email protected] or (818) 825-9583 and leave a detailed message. RSVPs must be received by Friday, Oct. 18. Valley Japanese Community Center held its 2013 Obon Festival in June.